The drinks giant's outgoing CEO Paul Walsh says we still 'have a long way to go' in making Britain competitive but steps have been made. Picking up the award for Britain's Most Admired Company 2013, Diageo's outgoing CEO Paul Walsh said credit should be given to the government for ‘the growth which is starting to come through’ and that the government has worked hard to make sure Britain is open for business. ‘The government has worked very hard to make sure our tax regime is competitive and it is becoming so – it’s not quite there. But good steps have been taken and we need to make sure we stay true to this course,’ Walsh said ahead of the Autumn Statement. 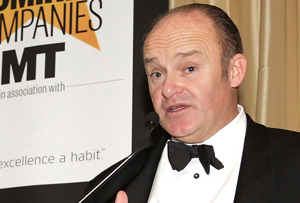 Speaking at the launch of Britain’s Most Admired Companies awards, hosted at Claridge’s on Tuesday evening, Paul Walsh attributed Diageo’s win to a single company message. ‘All our colleagues round the world have embraced the notion to promote our product responsibly. We do understand that in the hands of certain consumers, problems can be created. But the way the company has embraced our marketing code is, I find, incredibly energising,’ he told MT. Diageo has won BMAC three times. With three wins under its belt, emerging-markets expert Diageo is now second only to the once-mighty Tesco in the annals of BMAC history. Tesco won no fewer than six times in the noughties, although today’s gloomy Q3 results suggest that it may be a while before beleaguered boss Phil Clarke adds a seventh to that tally. Find all our BMAC coverage here.